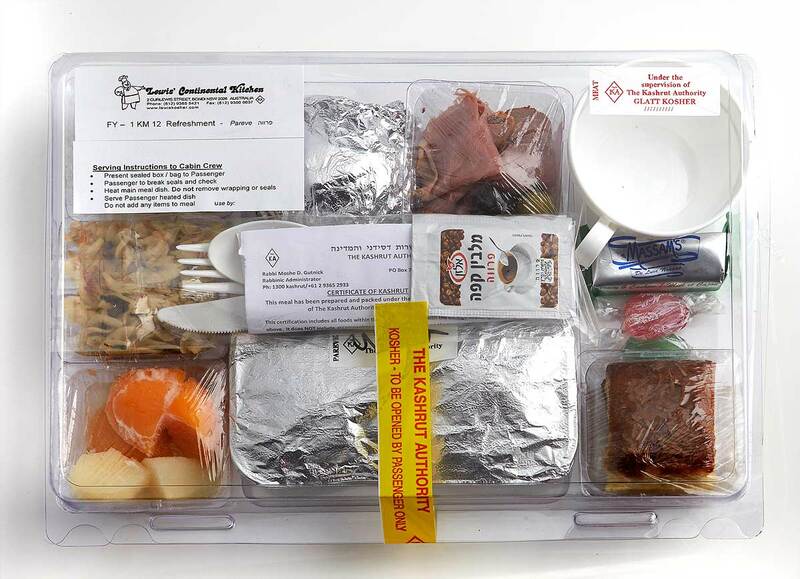 Our kosher kitchen supplies kosher airline meals to airline catering centres throughout Australia. Since 1991, when Lewis’ was contracted by Qantas to create a new Kosher airline meals and kosher food service for in-flight meals, until the present day, Lewis’ has been working closely with the top airline chefs. We are recognised for our Kosher airline cuisine and strive to make in-flight Kosher meals great! Our Kosher airline meals are created to be tasty, nutritious and above all compliant with the most stringent Kosher standards, as all preparation is supervised by the Kashrut Authority Inc.
Our team continues to have a pro-active role in the airlines kosher menus, for example, working closely with Qantas to develop and streamline processes from menu design and recipe testing, through to the way the food is delivered onboard the aircraft. Today, Lewis’ provides a number of airlines leaving Sydney and Australia, and we receive a great many letters and emails from satisfied travellers. We thank everyone who has taken the time to write to us over many years and encourage you to send us feedback on your Lewis’ Kosher airline meal. Lewis’ now supplies all airline catering centres in Sydney, interstate as well as some overseas locations. Lewis’ philosophy has always been to source the finest produce and this philosophy has been carried into our airline meals. As well, we always wanted to serve fresh meals on aircraft, and some years ago we were able to instigate this plan with Qantas. First, Business and Premium classes now serve fresh Kosher meals to passengers. LEWIS’ TRAVEL TIP: To order your Kosher airline meal, please contact your travel agent or the airline directly. We recommend you order your meals at the time of booking your flights, to give the airline as much time as possible to meet your Kosher needs. If you are a frequent flyer, put “Kosher“ on your customer profile to ensure that you are always served a Kosher in-flight meal.